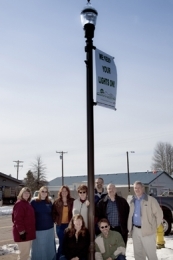 The La Pine Ford Leadership Team, a team of south Deschutes County “Citizen Leaders” recently announced the completion of the Huntington Road Lighting Project sponsored by the Ford Institute for Community Building. The leadership team—seeded with a $5,000 challenge contribution from the Ford Foundation when they began their project almost a year and a half ago—raised $52,000 in cash and in kind services for the project. The Ford Institute for Community Building came into La Pine with the following mission statement: “to enhance the vitality of rural communities.” The Ford Institute operates within the framework of the following core values: integrity, stewardship, respect, independence and community. Their goal is to mentor leaders within rural communities. In January 2009, La Pine graduated the largest class to date—including the youngest, Carmen Pierce, and the oldest, Betty Skinner—to ever take part in this program. After two months, and many ideas and concepts, the class adopted the “Huntington Road Lighting Project.” The purpose of the lighting project is to add light posts—complete with banner arms for seasonal and community advertising—on a dark stretch of road for the safety of the children, community members and local businesses. This project was full of many challenges, but the La Pine Leadership Group does not know how to let something go after they’ve sunk their teeth into it! The initial goal was to fund five lights along the corridor of Huntington Road between Ace Hardware and the intersection of Highway 97. With the support of the business community, members and city, enough funds were raised to have 10 light poles installed. Banners have been displayed on the finished light posts, thanking the sponsors. In addition to the funds raised to purchase and install the light poles, it was the vision of the group to raise enough funds to pay for the power charges on these light poles for the following 10 years. The team worked closely with Midstate Electric to research the amount of money required for a yearly fee per light. This figure was then added to the total purchase price of each light, thereby making these lights a true gift to the city of La Pine. The community and the city of La Pine are now seeing a brighter future due to the lights on Huntington Road, and the leadership of the group, which inspired it.